Bradley, firefighter, takes a moment to go over his duties for the day which include cleaning up the premises and cooking two full meals with money collected from fellow firefighters. He is responsible for the shift's nutrition for this 24 hour shift. The fire station's dorm rooms have unsealed walls in order for fire alarm signals to be easily audible. 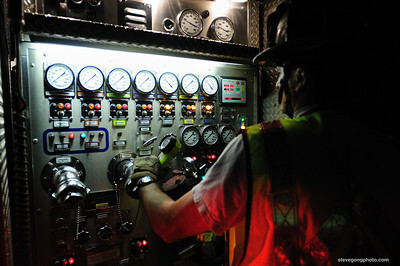 Most firefighters report they rarely have productive sleep while working a shift, even if there are no calls. Chris, 27, takes an initiative to wash the fire engine. 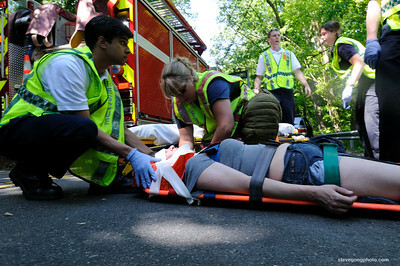 Like most, he is proud of his line of duty, and makes sure the department does not have a "bad image." 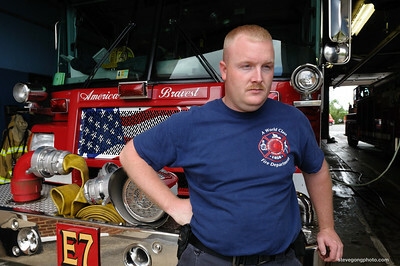 Chris, a Charlottesville local has been a devout firefighter since graduating from high school. 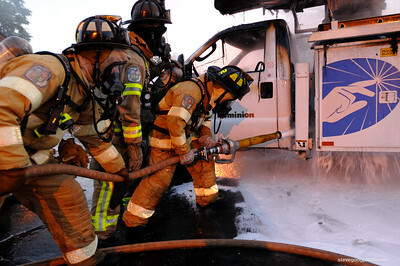 For more intense fires, fire retardant foam is used. Unlike water, fire retardant foam more effectively cools down fire and is able to coat the fuel, preventing its contact with oxygen, which results in the suppression of combustion. 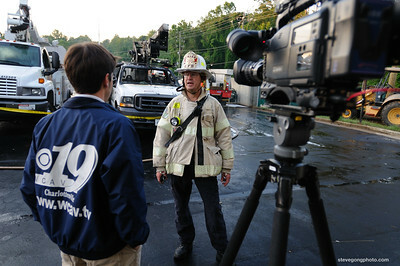 A local television reporter is alerted to the fire through his radio scanner and arrives just in time to solicit a report from the fire chief before the fire department leaves. 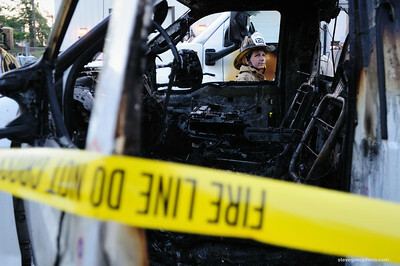 Emily, 36, carefully inspects the degree of combustion on this vehicle to gather evidence. 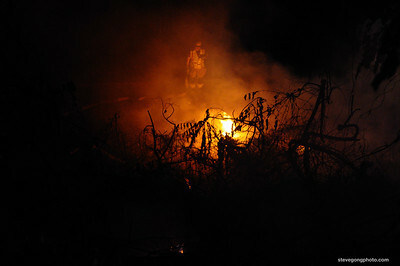 Often, the cause of fire is unknown and thus presents a problem for future fire prevention. Jesse, 34, refuels Engine Co. 7 with diesel. "Every drop counts" when so much fuel is consumed by having to carry a huge water supply. Uniforms are tailor made for an exact fit. The department has voted on a new design that the firefighters are eager to endorse. Chris, 27, takes extra care in his cooking by finely dicing peppers. 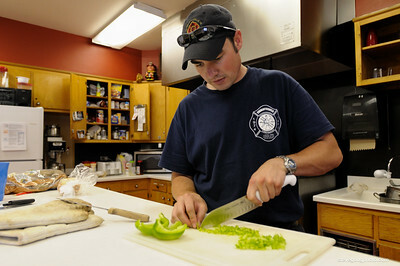 Firefighters take turns cooking and those unable to cook take on other chores such as cleaning the dishes. Leftovers are always saved and made available for the next shift. Bradley (right) is hailed as one of the best cooks at the station. Firefighting often runs in the family, and many firefighters share family names with the honored retirees. 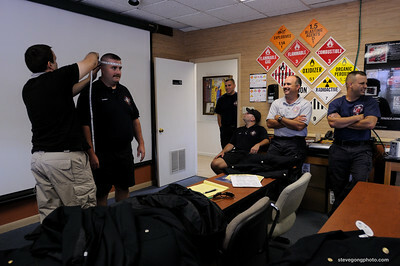 During an Emergency Medical Services training session, these firefighters exaggerate the severity of the incident to anticipate for the worst as well as to have a good laugh. 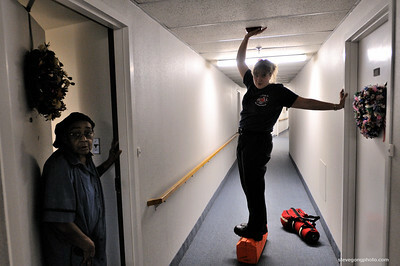 A concerned senior resident of a home looks for fires in the hall, having been alerted by the smoke alarm. 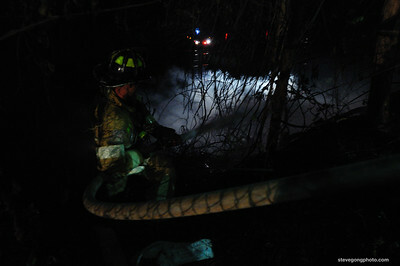 Ashley attempts to cover up and minimize the noise from the smoke detector while others on her team look for the fire. 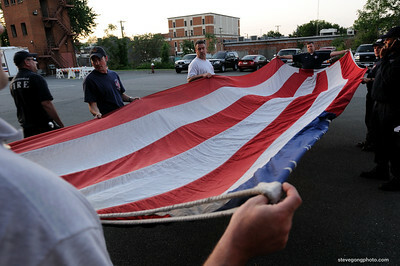 "Out of respect", "A" shift's firefighters refold the US flag, taking care to smooth out the wrinkles as a result of having stored the flag unfolded. Craig and Scott stop at a local fast-food stand for an ice-cream before returning to headquarters. 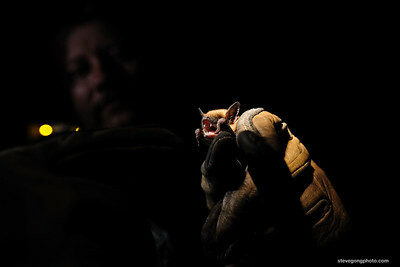 Many Charlottesvillians support local businesses by "buying local." This particular vendor refused to accept money from firefighters. Max, a local boy with an aspiration to become a "fireman" is ecstatic to sit in the interiors of a fire engine. As I put my hand out to cover the glare, Max thinks I'm waving to him, so he waves back.